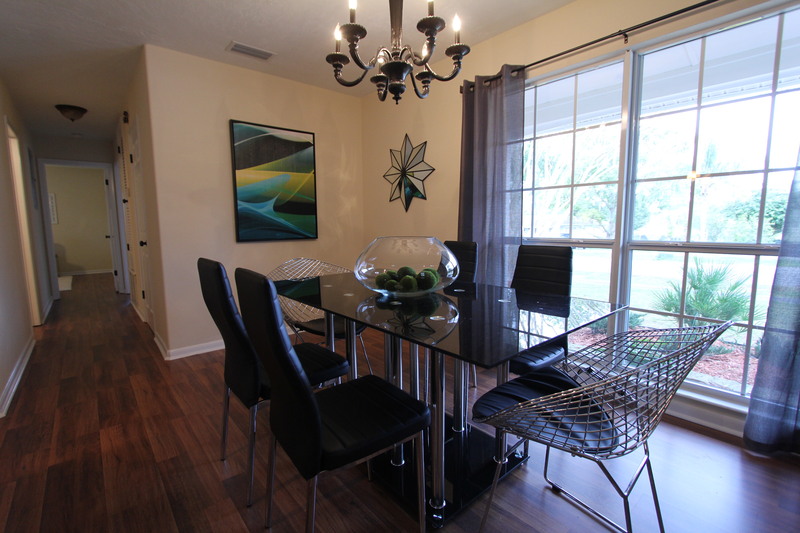 See how Realtor (R) Elisa Edwards had her Windermere townhouse listing transformed – The agent from Watson Realty Corp. had a listing in Windermere on the market for a few weeks when the owners agreed to a drastic transformation. 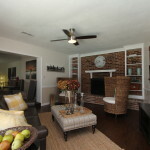 The staging should give the marketing the competitive edge and show the true potential of this newer townhouse. 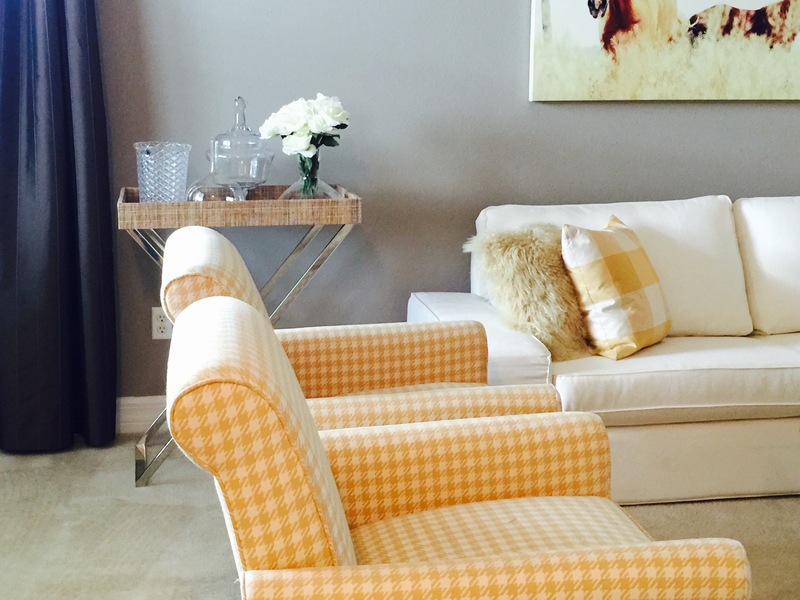 The house got furnished by professional stager Helene Bonello-Strauss. The style used here was a modern look with rustic and eclectic accents – a mix that had shown to be very attractive to a large audience of homebuyers. The empty townhouse did not show all that it could be when it was vacant. 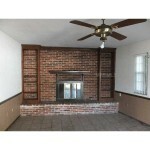 The owner was happy to hire www.idesigntosell.com to help with the transformation. The open concept living room with an unusual dining space in the kitchen required a good solution to visualize the potential the house has. Most breakfast nooks are set up for smaller round or square dining spaces. This one had a long bench and a narrow space between the breakfast bar and the back wall. Designer Helene Bonello-Strauss found the ideal solution with an elongated table that would sit 4 to 6 people easy. While making the most out of the space it left plenty of room as the traffic area is left wide open. The living room was set up with a fairly large sectional. This shows off the size of the room and leaves enough room for a desk and chair on the back wall. That offer multiple uses for the new owner. The desk can be used to pay bills or for the children to make their homework while the mother is preparing meals. The room is designed in a way that if functions as the social hub for the house with many uses combined in one room. The master bedroom can be described like ‘a day on the beach’. Light blue walls led the way to a fresh and airy color scheme. Instead of chunky dressers Helene chose a set of two chairs covered in white cotton and a small round wood table to create a spot to relax and read a book or have a morning coffee. Having a small settee or a chaise in the bedroom can add additional use to a room that otherwise would be only used for sleeping. This truly transforms a bedroom into a suite. Anyone interested in this beautiful townhouse contact the agent at www.elisaedwards.com for further information. Cute two bedroom home sold – This nicely remodeled two bedroom home underwent a full renovation. This house is proof that with the right furnishings and updates an older house can look great. Fantastic design is not always a matter of size but more a question how the space is utilized. This house has 1200 sq ft living space and presents itself as a very livable home. The fit and finishes are a far cry from the typical run down rentals in the area and speak to a buyer who wants a bit more than the bare minimum. A sophisticated living space like this in another location could be quite costly. Here in West Volusia County a house like this can be owned a very attractive pricing. In this case just under $ 100k was the budget to own it. 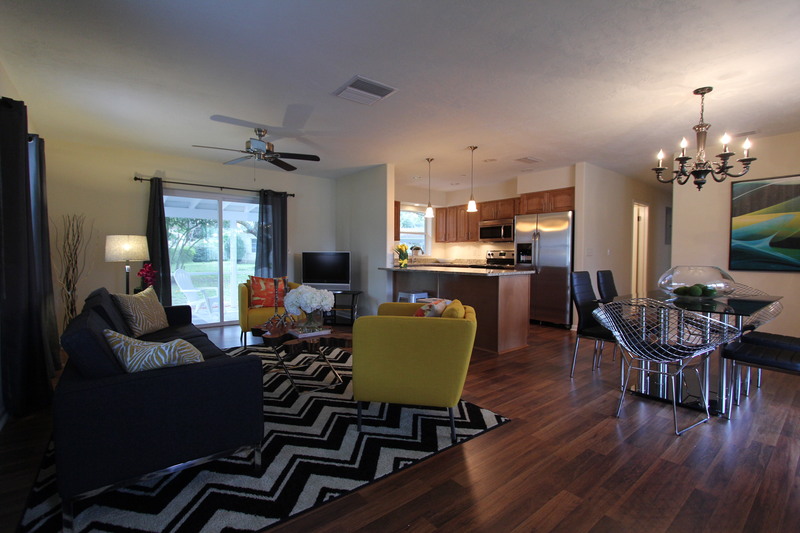 Nice wood floors and a brand new open kitchen give a spacious appearance to the living area. We chose furniture that has a slim scale. The sofa is a contemporary 3 seater with slim armrests so it takes up less room as traditional roll arm sofa would. The contrasting chairs deliver a pop of color. The yellow accent color is continued with accessories and accent cushions on the sofa and the pendant lights over the kitchen counter. Carrying one or two accent colors throughout the room helps to unify the space and create a seamless design. 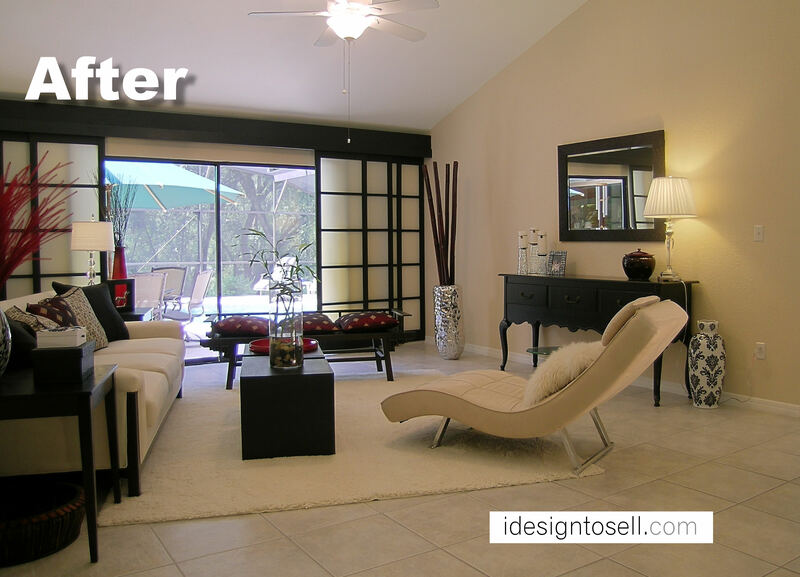 Especially in an open living room it is important to show a buyer how the space can be utilized. For the dining room we chose a contemporary glass table and slim leather parson chairs as the side chairs. We paired them with chrome end chairs. The chrome mesh leaves them looking light and fresh while the black seat ties in with the other chairs in the set. Not everything has to match in order to look coherent. It often creates some visual interest if the pieces are carefully chosen and have some aspect that ties them together. The overall theme has more of a contemporary vibe. We use a fresher urban design language to contrast the 60’s age of the house. It supports the new renovation and lets the house compete with new construction homes in the area. Despite having only a carport, two bedrooms and one and a half baths, this house sold a hair under asking price. This is truly a small house with a big attitude. Winter Garden home sold in 15 days after staging – Realtor (R) Scott Butts with Remax 200 Realty sold his listing on Rainfall Drive in 15 days market time, after a professional staging job from interior designer Helene Bonello-Strauss. The average market time for homes sold in the same neighborhood last year is 70 days according to the central Florida MLS system. The owners had already moved out so the staging should help to show off the spacious formal living area with the adjacent family room off the kitchen. Realtor Butts suggested to the owners to consider professional staging to give the house the competitive edge over the other listings in the area. This obviously seemed to be a smart move and it shows that a good Realtor can do wonders for your sale. 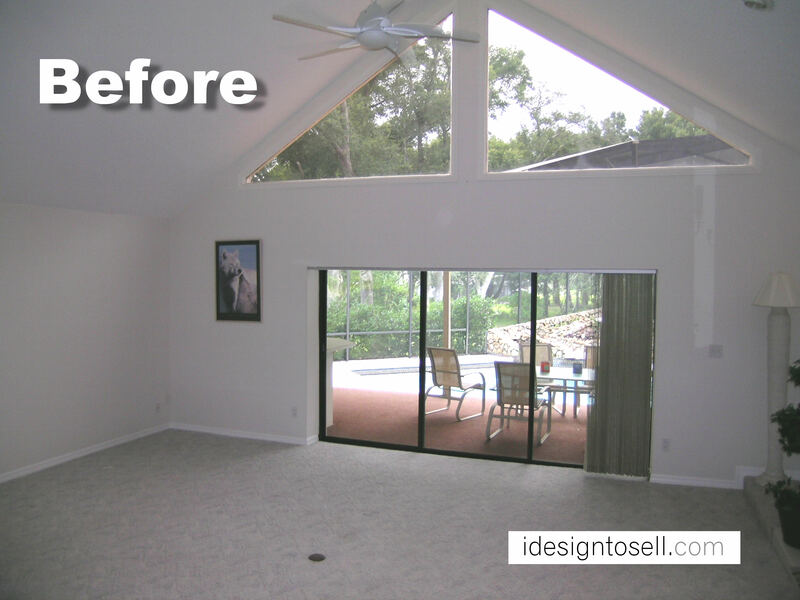 At the same time a great staging job can help to achieve your goals in record time. Sometimes it takes a few things to work hand in hand for a successful outcome. We congratulated the owners on their success. And our team at www.idesigntosell.com looks forward assisting other real estate professionals and homeowners with their goal to expedite a sale and to maximize the profit. 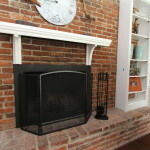 Stylish Appointments can really help to elevate a house to the status of “home”. Tip: How to design around assets that you have in your room. Sometimes the best thing you can do before starting a re-design of the space, is to take inventory of what is there. Starting from scratch is not always needed to get to a stunning result. In this room the window treatment was a Asian inspired screen that gave some architectural interest to the otherwise ordinary sliding doors. 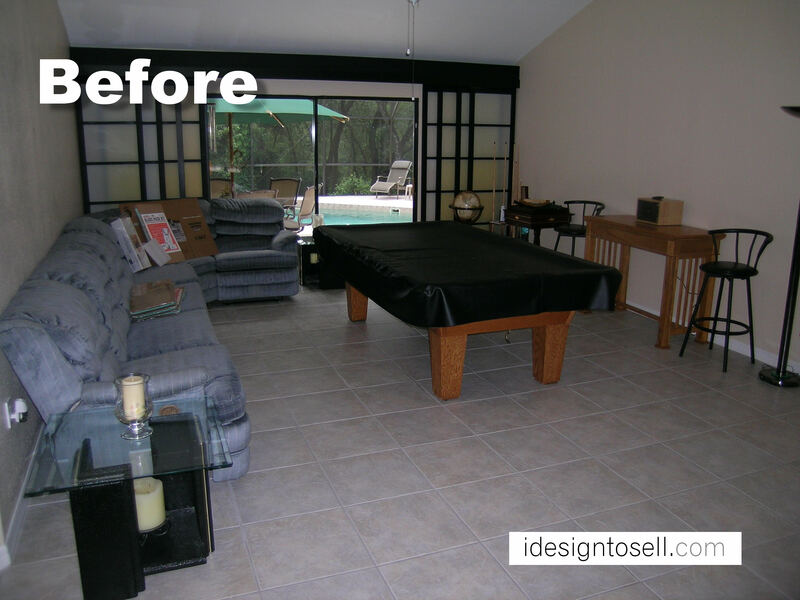 The rest of the furnishings were just mismatched items arranged around a pool table. The Orlando interior designer Helene Bonello-Strauss took the screen as a starting point for the overhaul. For the re-design she transformed the space to an Asian inspired room with transitional elements. The sofa and sofa table had low rectangular lines that reference Japanese design elements. The colors are pretty much a black and white scheme as it is found in the screens. The buffet had updated traditional design elements but because of its simplified form and the flat black finish worked well in the arrangement. The center of the room is dominated by a mid century chaise that gave some added interest to the room. It showed off the space and at the same time added some sophistication to the arrangement. Asian design is typically minimalistic and has very simplified lines. The black bench has a very low backrest and worked well in front of the sliding doors. It gave opportunity to provide additional seating without obstructing the view of the doors. The accessories go with the general direction without being too literal. Some Asian vases on the buffet speak to the idea while accompanied by sparkling accents with similar shapes. The bamboo and the grass in taller floor vases gave the visual height needed in the arrangement. All accents are held in red, giving homage to the Japanese flag. Now the screens in the back are an integral part of the whole room design and appear totally intentional. There is an old saying: “If you can not hide it, embellish it.” No one would think that those were existing items that inspired the rest of the room. We have now an architectural feature that adds value to the property because we were able to demonstrate how it will enhance the space and show in a coherent design concept. 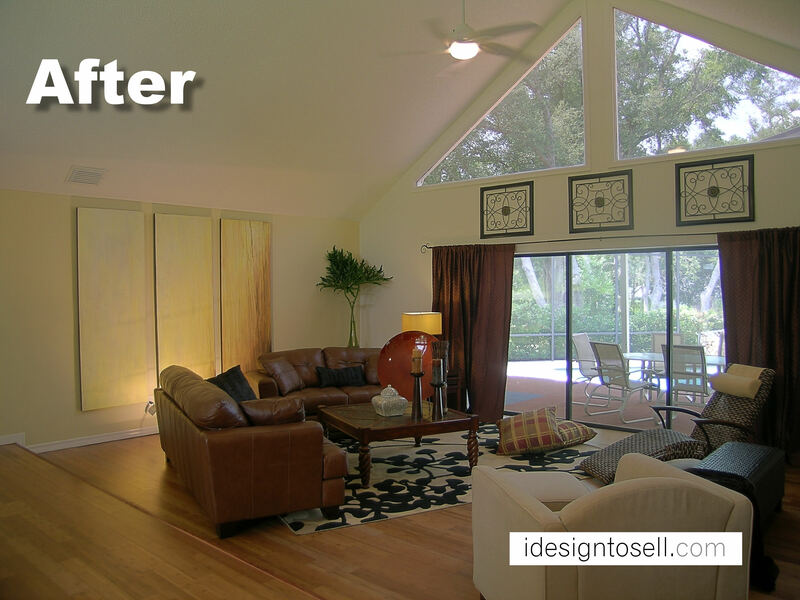 Design Tip: How to take a tired room and refresh it with cosmetic changes. This house had a living room with stunning 80s architecture. Unfortunately the nice architecture was overshadowed by an ocean of berber carpet that was screaming for a change. 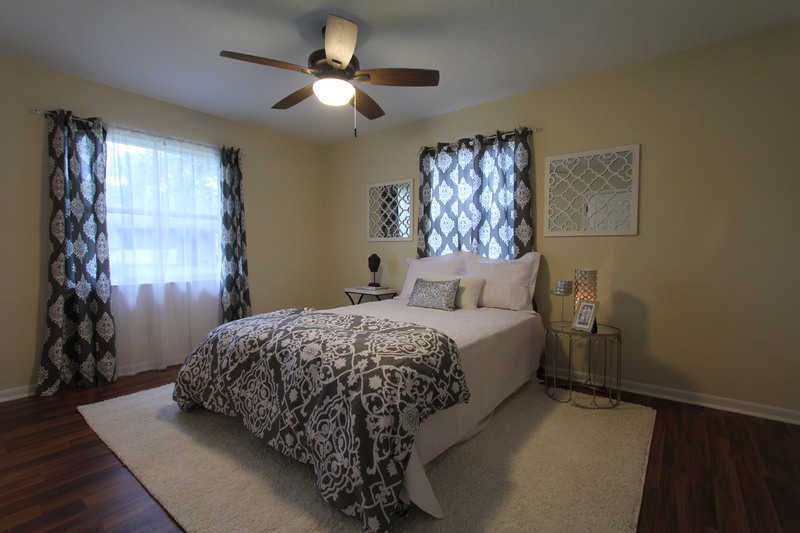 Helene Bonello-Strauss convinced the owner to swap the carpet to a bamboo wood floor that would provide a durable solution for this room while giving it an updated feel. The walls in flat white did not do anything for the visuals so a coat of paint in a neutral almond paste color gave it some sophistication. The wall to the left needed some focal point. A high quality art piece gave the room some interest. The furnishings were more traditional in nature, focusing on the comfortable side of life. The sofa and loveseat were arranged off the walls and in an angle to the room, to grab more of the space and to break up the lines. Instead of matching chairs, the designer added a fabric accent chair and a wicker Chaise to provide a contrast in textures to the leather of the couches. This helps to give the room a more eclectic feel. For some green in the room Helen just cut a few philodendron leafs from the yard and placed them in a vase. A much better solution than dusty silk flowers. Accent iron pieces populate the vacant space over the sliding doors and simple drapes give the back wall some contrast and warm up the room. This design has some contemporary aspects like the bamboo floors, the large art pieces and the use of a wicker chaise, while maintaining s otherwise more traditional design language. This room speaks to a large audience. Good design does not have to be cold or uncomfortable but can be easy to digest if done right.